Nate Strandberg of Eight Hour Day wrote up a nice little blurb about our show in Minneapolis last November. I didn't have room in my luggage to bring my nice camera, so I'm excited to see his great photos of the show, too. 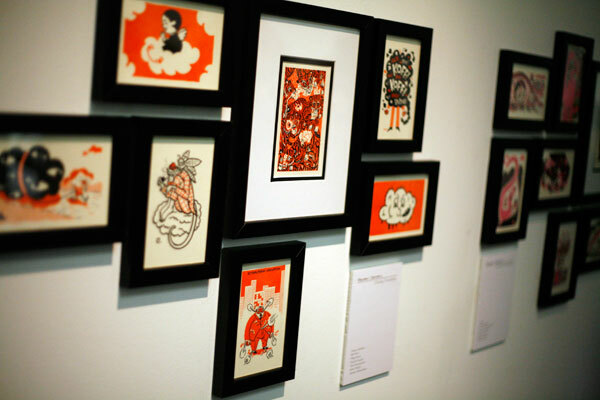 In the coming months, we will post the remaining framed prints from the show here on the site for sale. It will be a rare opportunity to purchase the prints individually, rather than in sets. Watch the mailing list for details. is an ongoing collaboration with artists whose work I love. We produce collections of original, limited-edition prints for very affordable prices, with free shipping to the US and Canada. We strive to produce beautiful, durable artwork with the least amount of impact as possible. We use sustainable bamboo or recycled cotton papers with plant-based or water-soluble inks. Plus, a portion of sales go toward a charitable organization. Mailings are infrequent, but you'll be notified about any new print releases, public events and conventions we are attending, and other fun things Cloudy Collection fans need to know.